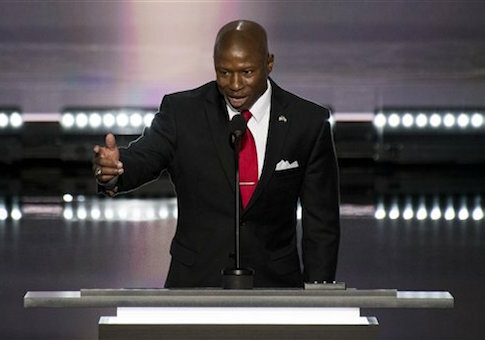 CLEVELAND, Ohio—Republican Senate candidate Darryl Glenn electrified the crowd at the Republican National Convention in Cleveland on Monday evening, drawing heavy applause for his comments on race relations and the police, saying "all lives matter." Glenn helped kick off a night of high-profile speeches, appealing to the crowd to support "our heroes in blue" in Baton Rogue and Dallas after a series of police killings. Glenn, a black conservative, Air Force veteran, and county commissioner, also criticized President Barack Obama for dividing the country on racial lines. The four-minute speech was marked with memorable one-liners, capturing the spirit of Glenn’s fiery speech in April at the Colorado GOP convention that propelled the candidate to victory in a crowded Republican primary. "I am often asked why are you a Republican?" Glenn said. "It's because the Democrat party is the party of handouts. After more than seven years, the only thing we have left in our pockets is change." Glenn called Obama the "divider-in-chief," adding America is "more racially divided today than before he ran." "Mr. President, I have a message," Glenn said. "This is not about black America, white America, brown America. This is about the United States of America." "Somebody with a nice tan needs to say this," Glenn said. "All lives matter." Glenn said Obama’s rhetoric has a "direct impact on the relationship between the community and the police," and appealed for unity. "We can bring this country together. But we must realize that our heroes in blue are part of the solution and not the problem," Glenn said. "Stand up and support those men and women in Dallas. Stand up and support those people in Louisiana. Blue lives matter," he said, drawing some of the loudest applause of the night. Glenn focused most of the speech on his personal beliefs and candidacy in Colorado, but gave a few nods to presumptive nominee Donald Trump, saying it was his privilege to support "our next president." He also took shots at presumptive Democratic nominee Hillary Clinton, saying she is "unfit to be president." "We all know she loves her pantsuits," Glenn said. "But we should send her an email and say she deserves a bright orange jumpsuit." Glenn is trailing Democratic incumbent Sen. Michael Bennet by six points in the polls, despite little fundraising or name recognition. The high-profile speaking slot at the GOP convention was seen as an opportunity to elevate his campaign in what Glenn called the "number one battleground state." "Here's the bottom line," he said. "American exceptionalism is alive and well. Evil exists. As God is my witness, the battle can be won." "Believe we can win. Believe we can change things. Believe it together we can make America great again."